Trenchless pipe replacement is often the preferred method of sewer line repairs among many homeowners. It offers a low-cost option that doesn’t require digging and ruining your landscaping to access the pipes. Yet, there are still many who don’t utilize these revolutionary services because they’re unsure of the details involved. When you talk to a trenchless water line repair company, they might use terminology that is unfamiliar to you. This can make it difficult for you to weigh the total benefits. To help you understand everything that’s involved, here are some common terms you might hear. This may be one of the most commonly used terms in trenchless pipe repair. Cured-in-place pipes (CIPP) refer to the material and method used to repair or replace piping. The method works by adding a liquid-based plastic-epoxy material inside of the damaged pipes and using pressurized air. The material then sets inside the damaged pipe to create a seamless, durable new wall coating. This process is what makes trenchless repair “trenchless,” because there is no need to dig up the old damaged pipes. Pipe lining refers to the general process and methodology of trenchless pipe replacement and CIPP. It is the method of repairing damaged pipes through the use of epoxy-resin solutions that can be completed in just one day. It eliminates the need for digging and can fix pipes damaged by roots, poor installation, bad joints, cracking, corrosion, and age. Pipe bursting refers to the method of replacing pipes that are too far gone to consider repairing via CIPP. It essentially works by “bursting” the old pipe into fragments and dragging the new pipe into the same space. The new pipe is seamless and occupies the same space that the old pipe did, eliminating the need to dig up the old pipe. Like CIPP, this process can often be completed in just one day. There are other phrases and terms that may be relevant but won’t necessarily affect your decision to go trenchless. Smoke testing, for example, is a process of testing the integrity of your pipes, and one section of pipe can be tested in roughly one hour. Terminology such as this can be better explained by your preferred repair company and shouldn’t hinder your ability to make an informed decision. If you’re interested in trenchless pipe replacement for your water or sewer lines, give us a call today. No one wants to be told they have a leak in their home. But it’s better to be told sooner rather than later, as residential leaks can cause astronomical water bills and severe damage to your home. Despite what you may have been told, you don’t have to pull up your flooring or dig up your yard. Let the professionals at Trenchless Replacement Specialists locate the source of the leak without the destruction! Think you have a leak? Our residential leak detection services can help! Your water meter reading changes when you are not using any water. (To test this, mark the indicator on your meter; don’t use any water for an hour; then check the meter. If the indicator moved, you could have a leak). You hear the continuous sound of water when nothing is turned on. (This sound can be similar to a toilet or faucet running). Your water bill increases over a period of weeks or months, for seemingly no reason. The foundation cracks or landscaping grows unevenly. Your walls or floors have wet or discolored areas (when nothing has been spilled). Foul smells coming from the floors or walls near drains or sewers. You find warm spots on your floor or in your yard. It’s possible for the technicians at TRS to determine the location of a leak by electronically locating the source. 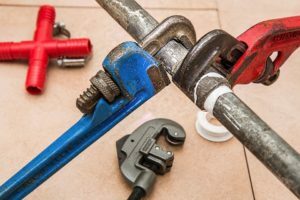 This is a distinct contrast to conventional trial-and-error methods of leak detection, which require tearing up property. You don’t have to do it! Save yourself the time, headache and unnecessary destruction costs and call TRS.